In 2007, I lived for a season in an off-grid permaculture cabin in North Carolina. No Name Creek gurgled through a lush forest, and I befriended the eclectic neighbors — organic farmers, biofuel brewers, eco-developers. I discovered a sustainable but imperiled way of life, and wrote about in my memoir “Twelve by Twelve: A One-Room Cabin off the Grid and Beyond the American Dream”. Alas, the book triggered angry questions. “It’s easy,” one Twelve by Twelve reader wrote, “to find minimalism, joy, connection to nature, and abundant time in a shack in the woods. 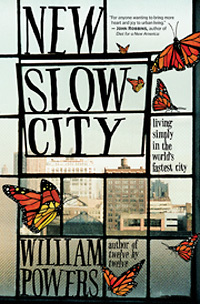 But how the hell are the rest of us supposed to stay sane in our busy modern lives?” This question was the genesis of my new book: “New Slow City: Living Simply in the World’s Fastest City”. I received — in fact — a hundred variations of this question after lectures and on radio interviews, and always answered by saying I was living 12 x 12 values… but in Queens, New York, the home to which I returned after my time in the cabin. But as each year passed, the reader’s doubt increasingly became my own as overwork, material clutter, and the lack of contact with nature — “civilization,” in short — brought me to a point of extreme unhappiness in Queens. Eventually, I too doubted it was possible to live 12 x 12 in a city, and I felt an urgent need to decamp far from urban life. Not so fast. As I reached this point, my newlywed wife, Melissa, was offered an excellent job that demanded we stay put in New York City, and I suddenly had no choice but to figure out how to take what I’d learned in the 12 x 12 — about the Leisure Ethic, connecting to nature, and living simply — and somehow make it work in the real-world context of a marriage and two careers. In an attempt to do this, Melissa and I embarked on an experiment. We sold or gave away 80 percent of our stuff, left our 1,600-square-foot Queens townhouse, crossed the Williamsburg Bridge, and moved into a tiny rental: a 340-square-foot “micro-apartment” — roughly two 12 x 12s — in downtown Manhattan. Melissa and I approached our thimble of an apartment through the ideas of philosopher Thomas Merton, who called his stark monk’s chambers “the four walls of my new freedom.” We stowed a minimal kit of kitchenware, toiletries, clothing, and books as if equipping a houseboat’s trim hull. It was a refreshing purge; the apartment seems to expand with each tweak. Beyond this minimalist freedom, I discovered that being “Slow” is not at all Luddite. Slow means cultivating positive qualities — receptive, intuitive, reflective— instead of the fast qualities so common today: busy, agitated, acquisitive. Dutifully, I 80/20ed my life and find that the principle holds true. In one particular week, for example, I looked at all the potential work streams — in international consulting, writing, and speaking — that I could pursue, and distilled out that week’s most strategic one in terms of income-to-time-invested and my current level of enthusiasm: a high-end magazine article. Then I overlaid the Hodgkinson’s Principle. Hodgkinson’s says that work expands to fill the amount of time available to accomplish it. Thus, having chosen the one most critical work activity, I corralled it into a tight timeframe, and found it works: I condensed what might have been five days of work into two! This approach spawned “reverse weekends” for me, where I worked smarter for two-days and took five-day weekends. This is not a utopian idea. Even Carlos Slim, the world’s richest person, recently called for a 3-day work week and Google is increasingly experimenting in lowering hours and thus increasing employee creativity and efficiency. •	Urban sanctuaries: Melissa and I began spending more and more time in natural and reflective places right in Manhattan, like Central Park’s Ramble and the tip of Pier 45. •	“Living at the third story”: I discovered I only need half my attention on the street level. As the rest of my focus rises up, I notice nut-brown oak branches and green leaves fluttering with white butterflies. An off-turquoise sky. Stretchy clouds. Ciao stress! •	Technology fasting. We “fasted” from our gadgets for stints, disabling our phones and setting email to vacation mode. This helped quality of our relationship because we had more time focused on each other. •	Silent meals. Even in Manhattan’s fine restaurants, we’d sometimes eat in total silence, deeply savor the food, scents, soundscape, and visual beauty of the restaurant in a meditative manner. Though not everyone will live twelve-by-twelve, all of us can ask: What’s my twelve by twelve? We can find the elusive contours of enough—and live there. Enough is the sweet spot between too little and too much. It starts with each of us creating space to slow down a little and ask the core questions, like: How do we find balance in a world that is changing more quickly than ever before in history? And how can we incubate a New Slow City that’s saner now and fit for the future? Born and raised on Long Island, William Powers has worked for over a decade in development aid and conservation in Latin America, Africa, Native North America, and Washington, DC. He is a senior fellow at the World Policy Institute and is on the adjunct faculty of New York University. A third generation New Yorker, Powers has also spent two decades exploring the American culture-of-speed and its alternatives in some fifty countries around the world. He has covered the subject in his four books and written about it in the Washington Post and the Atlantic. 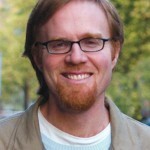 An expert on sustainable development, he is a freelance writer and speaker. More information at www.WilliamPowersBooks.com.